One thing I have discovered from this year is that I love wearing maxi dresses and don't want to give that up in the colder weather. 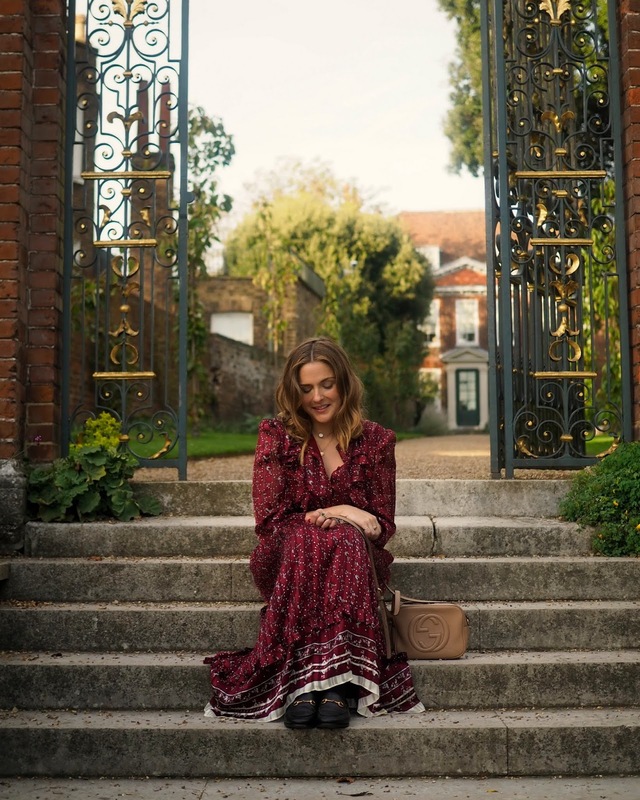 So I've got myself a couple of long sleeved maxi dresses (a few more will feature on the blog in coming weeks) including this one from And Other Stories. I absolutely love this brand for their dresses, I must have 3 or 4 now. They always fit me so I can shop online (European sizing, so 38 is a 10, 40 is a 12, etc) and they're always a decent quality and under £100. My ones from three years ago are still going strong too. I've put my favourites from them this season above. Obviously you shouldn't rely on one store for options, so I've had a look around and picked out my favourites starting with more expensive ones and working my way through to high street. Here are some unintentionally black/navy ones as I find them really easy to wear - pair them up with leather jackets and trainers for day time, and coats and smart ankle boots for the evenings. Ganni features heavily (I own this one and love it), it's just her £200 which I don't mind spending from time to time when the colours are so neutral. I know I'll wear it again and again. It's really worth checking out Whistles for this kind of thing and don't be mistaken for thinking the brand is uber expensive still (what on earth were they thinking 6 seasons ago when everything was over £300...). I found this one at Selfridges in the sale, a bargain at half price. This one from Michael Kors is stunning, stunning. Perfect for Christmas parties for people who don't know what to wear. This Me + Em dress is gorgeous, I spotted it on a lady on the tube a few weeks ago and asked her where it was from. I seem to be the only influencer on the planet who doesn't wear this brand every day - I think this dress might be the push I needed. For a little bit more colour, RIXO is great. This one is brilliant and a new shape for them. Previously I found the brand pretty fatt-ist - I couldn't get into their dresses, but this seems to have improved. Lets talk about printed dresses because they're the easiest to wear. They do all the talking, pair them up with a basic coat and boats and off you go... Now I mentioned high street before but for maxi dresses in particular I really want to give an enormous shout out to ASOS' own brand stuff. It's really, really good and lots of them are under £40. I've bought two from them and been really impressed with the quality for the price, so I thought with that confidence in the price points I'd check out and see what else they have. 45 minutes later, I'm back to report it all to you...! In fact, I mentioned RIXO before, there are so many very similar ones on ASOS. I'm always a little bit on the fence when it comes to obvious copies but I guess nobody owns space-print, right? This dress is awesome and £40. Equally, Insta-brands like Lily and Lionel, Rouje and Reformation are kind of asking to be copied. 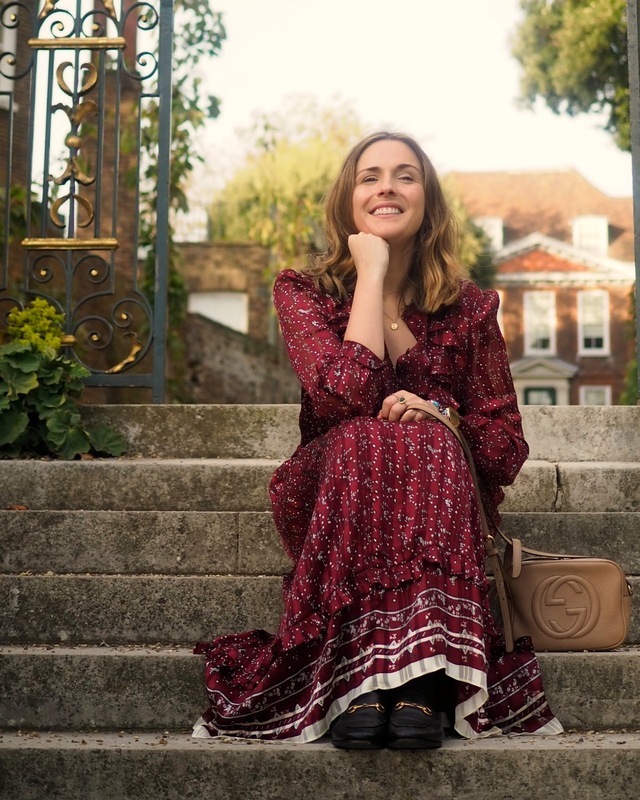 I own a Rouje dress and have to say, I haven't found a high street alternative that matches the quality of them (they're epic, check them out here) but their distinctive side-button thing is now hitting stores across the board. This ASOS dress is near on identical cut and print wise, and £120 cheaper. Above are my favourite, tasteful copy cat dresses. Finally this leopard print dress is so good for £38 and love the cut - very flattering. Here's a round up of some plainer style I've found. The idea here is to be able to wear them to work with tights and boots in winter, and possibly to work as most would work with a jacket on top too. I absolutely love how throw-on they all are. Most of them don't even require ironing which is a total win. My favourite two are this navy Monki shirt dress (also would look awesome with a basic jumper on top with the collar poking out, and this comfy-as-hell wool-sweater dress. This one is on sale, reduced to £35, and would be super for work. This green khaki dress is a brilliant colour for paler, autumnal skin tones and looks great. Ooh and I challenge anyone not to feel good in this. Flattering waist, great neckline, good price point. You're welcome. Finally, these two Marks and Spencer basics will be old faithfuls in no time. This black one is brilliantly easy to wear, and this blue one (comes in various colours) is great for anyone worried about losing their shape in a maxi dress.